The University of Texas at Austin boasts the #1 ranked Advertising program in the United States. My focus within their graduate program was Account Planning, or studying consumer behavior to gain insights that can be applied to advertising efforts and customer interactions. Class projects included the Austin Farmers’ Market, the Former Texas Rangers Foundation, Barfly by TouchTunes, concert hall music, and binge drinking. For my Master’s Report, I researched how to increase public visits to the Rob & Bessie Welder Wildlife Foundation, a privately-owned research facility located about 30 miles north of Corpus Christi, TX on a 7,800-acre wildlife refuge. My research included interviewing school teachers (public, private, and home) who had taken their students on field trips to the Refuge, and comparing it to the experience that public visitors enjoyed. To gain insight on the Welder brand, I interviewed the director and his wife, the graduate student in charge of school visits, and a Welder fellow from the early 1970s. Accompanying my 48-page report was a 12-minute video I edited from my interview footage. During my last two years at Brigham Young University, I was hired by Dr. Fred Woods to be his Research Assistant. Thus began an exciting period of tutelage in historical research and scholarly writing that has left an indelible impression upon me. Below is a list of the two books and six articles I assisted him with. Fire on Ice: The Story of Icelandic Latter-day Saints at Home and Abroad tells the story of the immigration of Icelanders to the American West in the 19th Century. My main responsibility for the book was compiling sources used in Appendix A. I also reviewed historical documents used in the text. One of the exciting aspects of this project was attending the dedication of the Icelandic Monument in Spanish Fork, Utah. In attendance were the President of Iceland and the President of the LDS Church. It was a memorable event. Another exciting aspect was that the book was later turned into a 30-minute documentary, Fire on Ice: The Saints of Iceland. When I first saw it at the private debut screening, I thought it was flawless and beautiful. 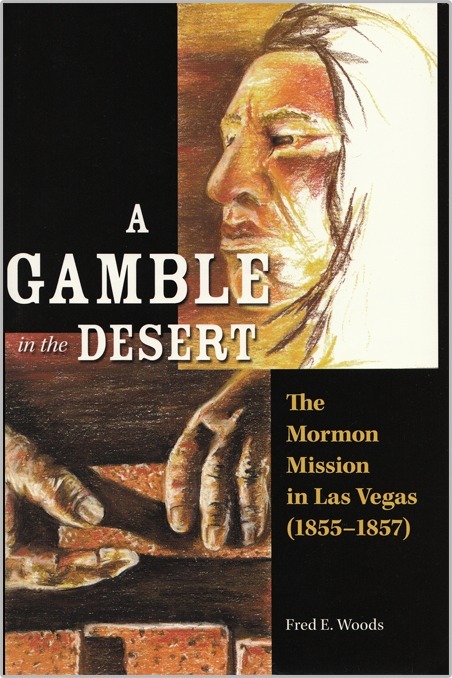 A Gamble in the Desert: The Mormon Mission in Las Vegas (1855-1857) tells the story of the original settlement of Las Vegas (in what later became the state of Nevada). For this project, I helped lay out each chapter, reviewed historical documents, and wrote the appendix (biographical sketches of the first 31 settlers). The book was released in 2005, the centennial year of the city of Las Vegas and the sesquicentennial of the original settlement. That summer, Dr. Woods participated in the festivities at the Old Mormon Fort and the book was placed in school libraries as a resource for K-12 students and teachers. 1. Fred E. Woods, “‘I long to breathe the mountain air of Zion’s peaceful home’: Agnes Campbell’s Letter to Brigham Young from War-Torn Virginia,” BYU Studies, vol. 46, no. 1 (2007): 84-94. 2. Fred E. Woods, “An Islander’s View of a Desert Kingdom: Jonathan Napela Recounts his 1869 Visit to Salt Lake City,” BYU Studies 45, no. 1 (2006):23–34. 3. Fred E. Woods, “Surely This City is Bound to Shine,”: Descriptions of Salt Lake City by Western-Bound Emigrants, 1849-1868,” Utah Historical Quarterly 74, no. 1 (Fall 2006) 334 –348. 4. Fred E. Woods, “‘Pronounced Clean, Comfortable, and Good Looking:’The Passage of Mormon Immigrants Through the Port of Philadelphia,” Mormon Historical Studies, 6, no. 1 (Spring 2005):5–34. 5. Fred E. Woods, “The Voyage of the Timoleon: Launching Latter-day Saint Missionary Work in the Pacific,” The Log, Mystic Seaport, Mystic, CT, 56, no. 1 (Spring 2005):12-21. 6. Fred E. Woods “Mormon Migration and the Fort Bridger Connection (1847-1868) Annals of Wyoming vol. 80, no.1 (Winter 2008):2-14. Later, when I was a graduate student at The University of Texas at Austin, I organized a speaking engagement for Dr. Woods at the University Catholic Center. He presented “Kalaupapa: Uncommon Service on Common Ground,” the story of interfaith charitable efforts at a Hawaiian leprosy settlement. Here’s a link to a televised version of his presentation and another link to a documentary he later produced on the same topic.